Mermaid wedding gowns are probably the most sought after bridal attire for those brides who want to show of their feminine curves. Mermaid style for this attire is known also as the figure-hugging one or hourglass style shaping tightly the body and flaring out from the mid part of the thighs or knees. This type comes perfectly beautiful and elegant for those brides who have balanced measurements for bust and hips. If you encompass these features, then you should know that wearing such a gown will definitely make you look glamorous. Taking a brief look into the mermaid wedding gowns 2009 collections we can define them created in a wide range of options. Some come with the cut of the flaring skirt from the thigh down to the floor while others flare down from the height of the knees. With this last option their skirts are mostly opened in the front side in order to allow brides move freely when entering their ceremony hall and walk down the aisle. 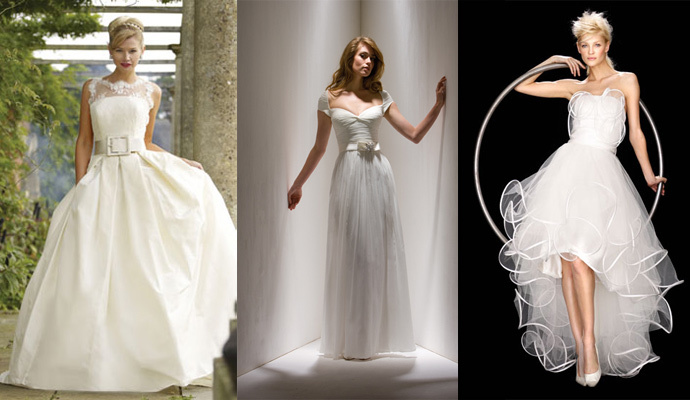 The texture of the mermaid wedding gowns 2009 also varies from silk made dresses to organza, taffeta and satin. There are skirts using several layers of rich ruffles to confer an airy and soft look to each step the bride takes when walking down the aisle, others come with asymmetrical pleats that are accented with a bow at the thighs height of the skirt. Other styles encompass the plain material shaped into the mermaid style conferring the look an elegant simplicity. But when considering the overall image of the mermaid styled wedding gown one can see it as the one that brings a dramatic look of a bride who is confident on her shapes and wants to be more sensual in the celebration of her most important day. 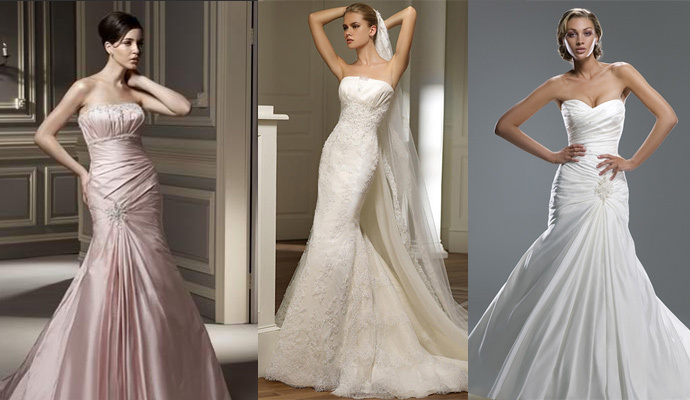 Many tall and slim brides with balanced body forms prefer choosing this style as one can see that it is very appropriate for these body measurements from several fashion catwalks displaying mermaid wedding gowns 2009 famous fashion designers’ collections. But this slim figure is not the only one that can be appropriate for this choice as full figured brides can as well decide on this type of wedding dress cut as long as they are confident on their looks. The types of bodices that come also in various formats can have a word to say in the choice of mermaid wedding dress. There are sweetheart shaped necklines at strapless fitted bodice, halter neck attached to the bodice and also the choice of lace ¾ sleeved bodices that are paired with options of veils made of the same pattern of lace comprised in the sleeves material. Some mermaid wedding gowns 2009 collections contain long train features with ruffled areas on the breasts and underneath continuing to flare down with entirely embroidered fabric. Another option comes with ruffled parts of the bodice and thighs and when flaring down it continues with plisses. The silver detail on the margin can pair successfully with lone sleeves allowing the dress to look quite amazing. Thin sleeves that are attached to the bodice are another feature for the dress made entirely of embroidered lace ending at its back side with a long chapel train. The back side of this mermaid wedding dress is designed with an empty portion that is surrounded by embroidered fabric in a nice motif. Another choice that you can consider to enchant your eyes is the sleeveless dress that has a tight corset and the bodice continuing to the thighs area. Nice waves are designed on the margins of the corset made of lace. The flaring skirt comes in ruffled material continuing with a train at the back side. When taking a brief look inside the mermaid wedding gowns 2009 collections, we can say that this style has always been and still continue to be timeless. So if you decide to wear this style do not be concerned that these dresses were on fashion in 2009 only, as they can always be gorgeous when being worn 2 years later carrying the same dramatic effect for the bride in her special day. You can browse online and look for these creations and you may have the luck of even finding fashion designers dresses that are sold at cheaper prices than they were by the time when displayed within the fashion catwalks.